A little while back (oh, who am I kidding? Quite a while, actually - I'm hopelessly behind) the Brookfield Library (in Brookfield, natch - that's Connecticut, people), chose Queen of the Road as that month's (I'm embarrassed to say which) book club pick. They have two groups that meet on the same day, one in the afternoon and one in the evening. I'm not sure which picture goes with which group, but we did have two lovely discussions. 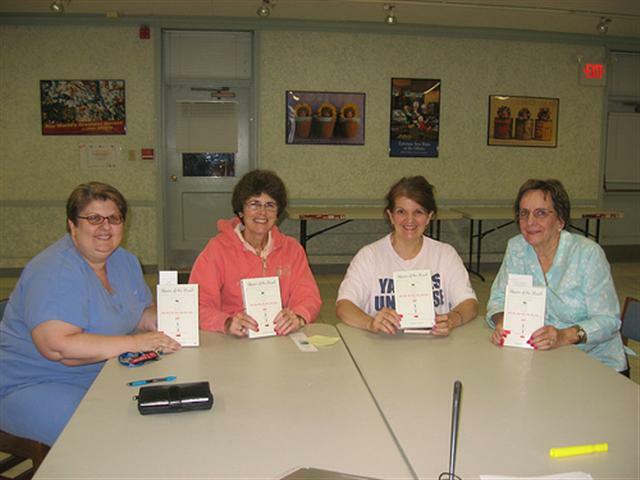 Adele Brudnicki, Carolyn Nuzzi, Elena Goletz, and Jan Furlong smile for the camera with their copies of Queen of the Road! From left to right, Library Director Anita Barney, Wendy Youngblood, Kathleen Olivieri, Judith Fisher, Ann Dupree, and Norma Fogarty pose with copies of Doreen's book. What a cute bunch of ladies! I think one of them is my Aunt Ruth. I wonder if it's a good idea to give a cocktail a name with 'hurl' in it. They look like lovely ladies. 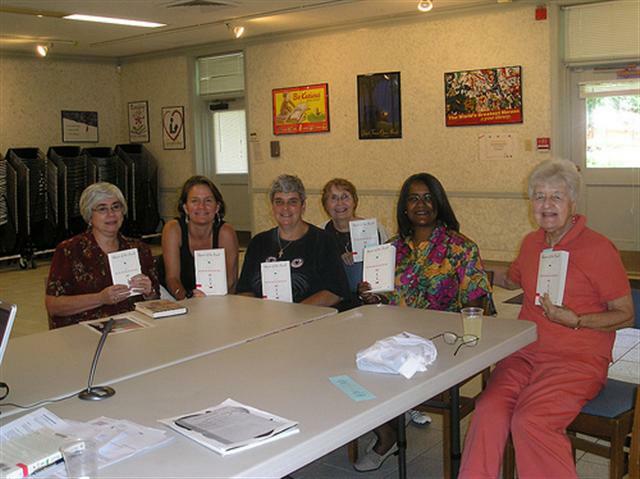 Next time, you can have a book club meeting at a truck stop. They serve drinks there, don't they? Popped over to say hi and see how you're doing. I read the sweepstakes idea on Kristen Nelson's blog, and want to thank you for sharing it. It's a terrific idea!!! Tim and I actually had a happy hour at a Wal-Mart parking lot in Albuquerque last year when we were passing through. There were two couples I knew from work, but had never met (and didn't know each other). A fun time was had by all. I mean, you haven't lived until you've done happy hour a Wal-Mart! Good thing you're kidding, Chris. Them's fightin' words! This page contains a single entry from the blog posted on October 3, 2008 9:30 PM. The previous post in this blog was An Evening with a New York Times Bestselling Author. The next post in this blog is On the Road Again (Again).